Great race for Frédéric and Sébastien, especially in stage 4 where they finished 1st buggy and 4th overall and in stage 3: 2nd buggy and 4th overall again. 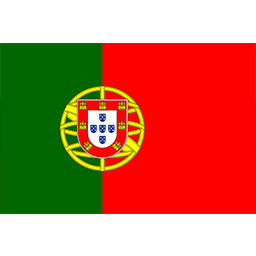 They will be back next year for sure, competing for the victory ! This seventh edition of M'Hamid Express was as usual a real pleasure! Each year we are happy to be part of this race with such a special atmosphere that everybody is looking for. Congratulations to Benoît, Fifi and the whole staff for this rally raid we would never miss. Bugg'Afrique team is there for 5 consecutive years. The team is back from this very beautiful 2016 Africa Eco Race edition. Bugga' One # 200 - Jean-Antoine and Agostino did a great race winning two special stages. Predator X-18s # 220 Jean-Hugues and Thierry did a great finish in Dakar, where they live. They are 10th overall ranking on this last special stage. Congratulation to the whole team. Next race : M' Hamid Express from January 24th till 29th. 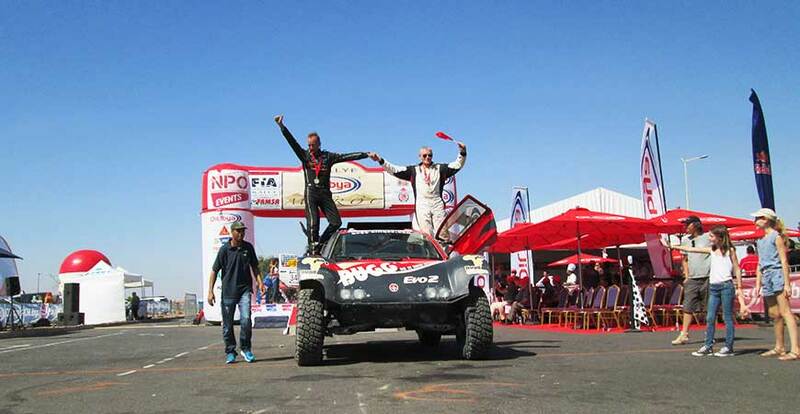 Bugg’Afrique – 2015 Rally Oilibya of Morocco – 2 buggies on podium ! - n° 325 Bugga’One - Jean-Antoine SABATIER and Denis ROZAND – 2nd in FIA 2WD class. - n° 434 Predator X-18s – Stéphane PILON and Guillaume FORVEILLE – 2nd in OPEN 2WD class. 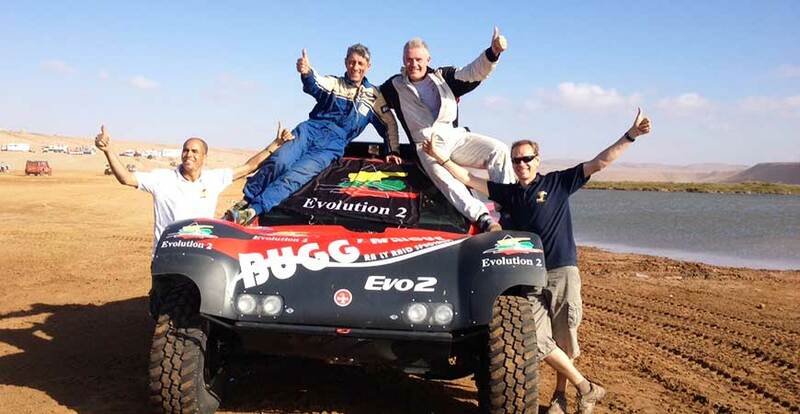 Libya rally 2015 : First successful Bugga'One rental! Jerôme Bonfils and his navigator, Bernard Irissou, had big fun and showed a perfect control. Bugga' One was as new at the end of 7 really hard stages of this Libya rally. 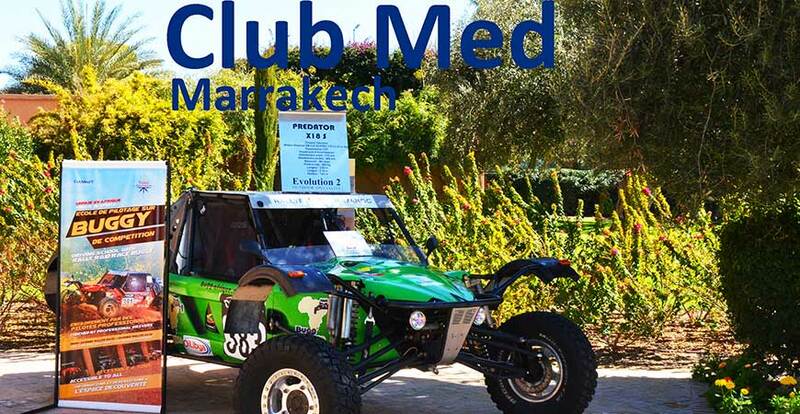 Club Med’s Marrakech La Palmeraie 5-Trident Luxury Space is a must-stay village, where you can now rent Bugg’Afrique’s rally raid cars. Our buggies are on show only a few steps away from the swimming pool. The exclusive racing cars we provide, along with the related supervision and safety skills and amenities, have enabled us to team up with this key international stakeholder in the hospitality industry through our partner, Evolution 2. Both of our teams involved did a great race for the 6th edition of the M’Hamid Express, with a very friendly atmosphere as usual! Frédéric PITOUT & Alain MULTINU just missed a top-ten finish by 13 little minutes. They finished 12th overall and 2nd in their class. For their debut experience, Eric MENARDO & Jean-Carl LOPES played their cards quite right and finished 27th out of 38 overall and 4th in their class. For those men and women who are eager to compete, the next rally raid is the Carta Rallye March 16-23, 2015. 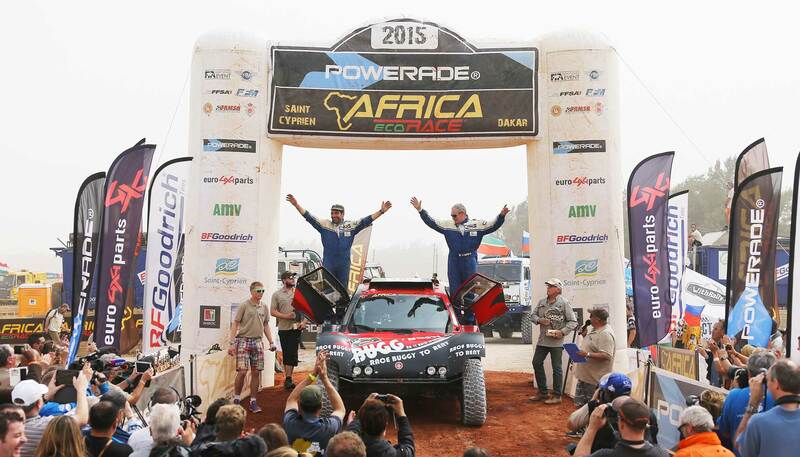 BUGG’AFRIQUE Wins the 2015 Africa Eco Race! 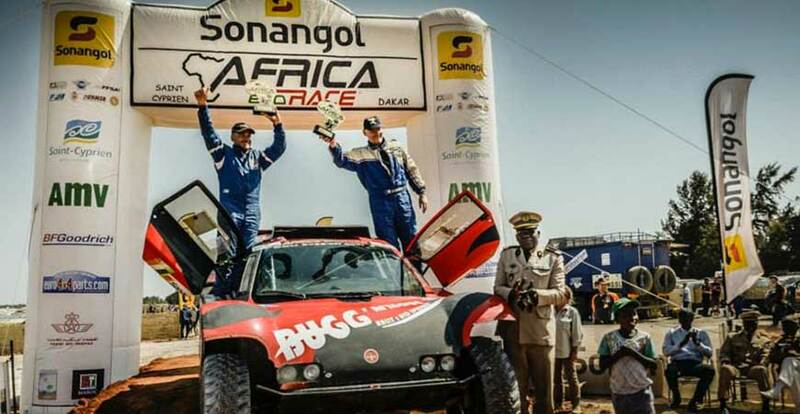 Drivers Jean-Antoine Sabatier & Jean-Luc Rojat won the 2015 edition of the iconic Africa Eco Race (formerly known as Paris-Dakar) with the Bugga’One from the BUGG’AFRIQUE Team. BUGG’AFRIQUE 2WD Petrol Win with the Bugga’One! 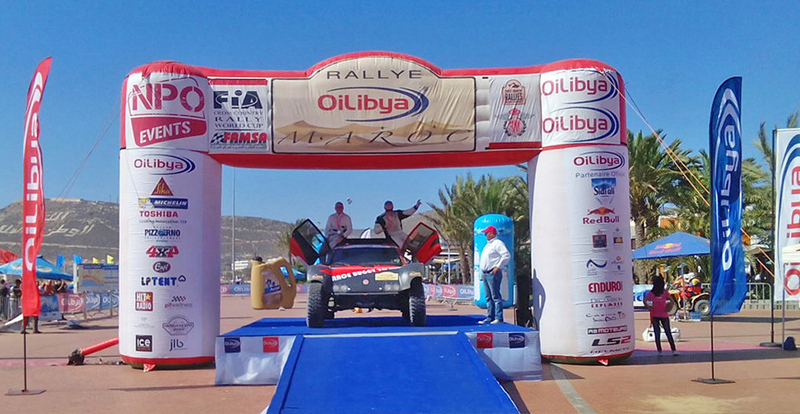 The BUGG’AFRIQUE Team did an outstanding job in the 2014 Rallye Oilibya du Maroc: Twice on the podium! Jean-Antoine Sabatier & Alex Winocq finished 1st in their class with the Bugga'One. Matthieu Serradori et Patrick Antoniolli took the 3rd place in the Open series with their Predator. Our two other Predator X-18s teams go back home with wonderful memories, so hats off them for their competitive spirit and tenacity! For their first rally raid, they ended up with quite decent rankings, Philippe Macé & Nicolas Duault finishing at #16, and Brice Berrard & Jolan Fromager at #18, out of 34 cars and SSV’s in the Open series. 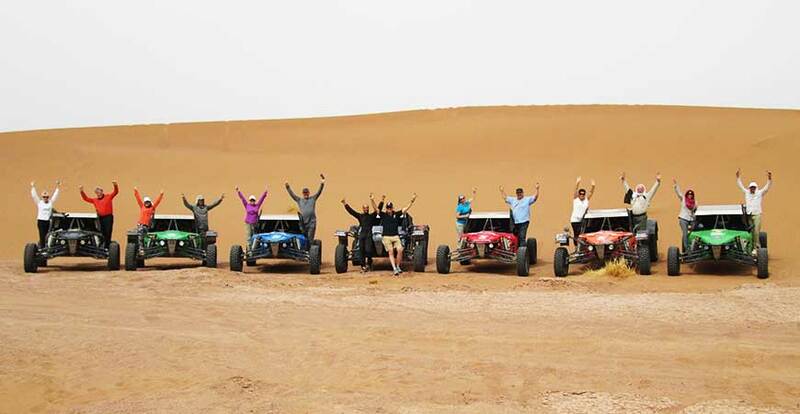 We first met our 12 very nice French Canadian guys at the La Mamounia hotel, and drove them down to the M’hmid dunes. We briefed them on basic driving skills and afterwards they went driving across dunes on their own. Our young drivers really had a ball, Chrrrrisssst of the TABERNACLE!!!!!!!!! 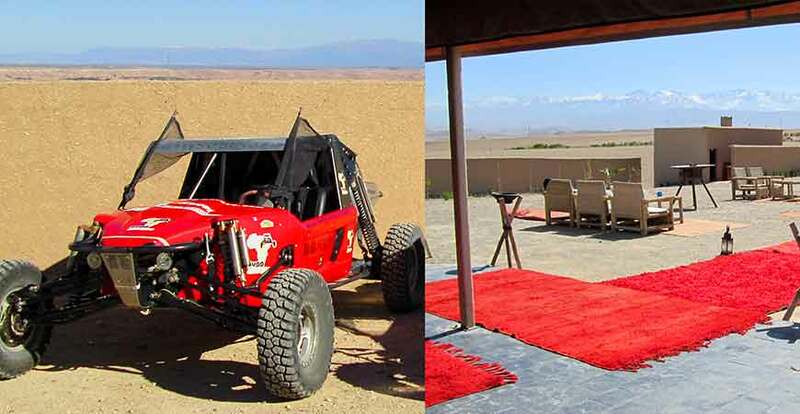 They stayed the night over under a luxury Berber tent in the dune desert, and we had a lot of fun together. 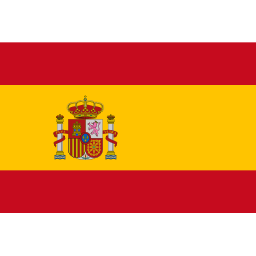 Next year, we will come up with an exclusive rally raid designed especially for them! 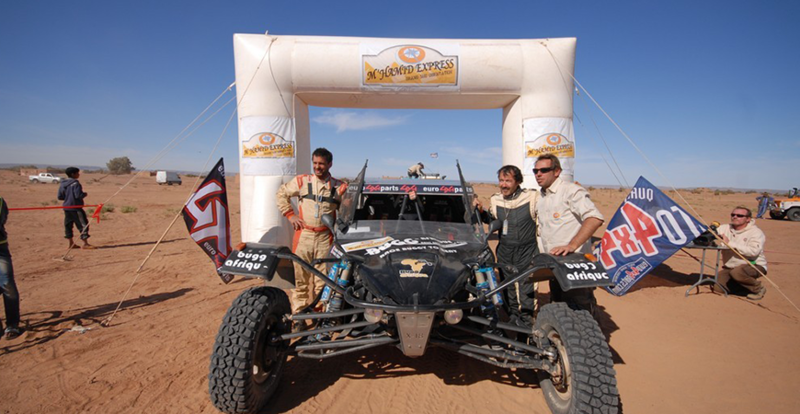 The BUGG’AFRIQUE Team had entered three buggies out of 54 drivers. They all finished the race, with 2 of them on the podium! David & Denis ROZAND finished 1st overall and 1st in the buggy series with their Predator X-18S. 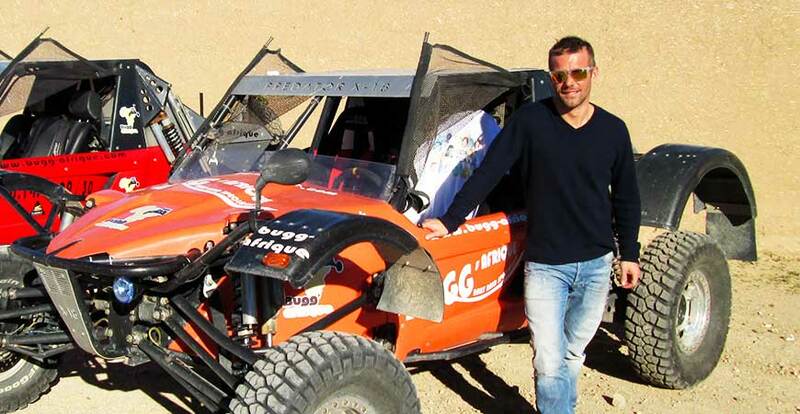 Jean-Antoine SABATIER & Vincent BROTONS finished 3rd overall and 2nd with the Bugga'One. 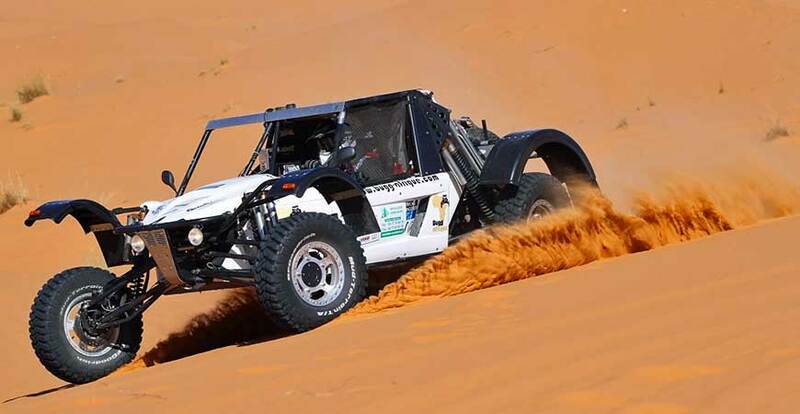 Michel OLLIVIER & Pascal CATTIAUX finished 36th overall and 3rd in the buggy series with their Predator X-18S. Hats off to all drivers. 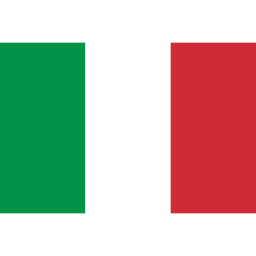 Next year we want the three BUGG’AFRIQUE buggies on the podium! A heads-up to drivers eager for victories and top-threes: Bugga'One, the best rally raid car, is now available for rent on all races. Your only concern is now to pick up your race. The 4 Predator entries all finished the race. Once again, the BUGG’AFRIQUE Team took all cars to finish. Special congrats to the LORMAND brothers who made great achievements with a stage win and a runner-up place in the 2WD final standings. For their first race, our two other drivers did quite well. 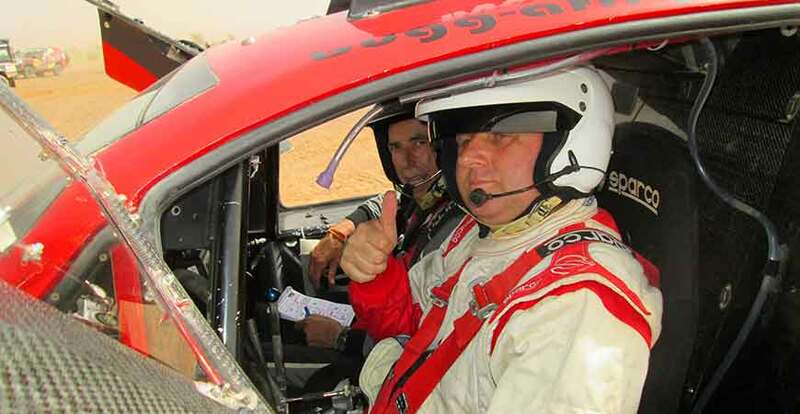 The M’Hamid Express was indeed their debut experience in rally raids and they did quite well. Hats off to Riad & Eric, as well as Alain & Aurélien; these last two did not know each other before! Jean-Antoine & Arnaud Foucault took third to complete the podium in the 2WD final standings. Special mention to the organizing crew and their supervisor, Ben, who is the driving force of this wonderful race! 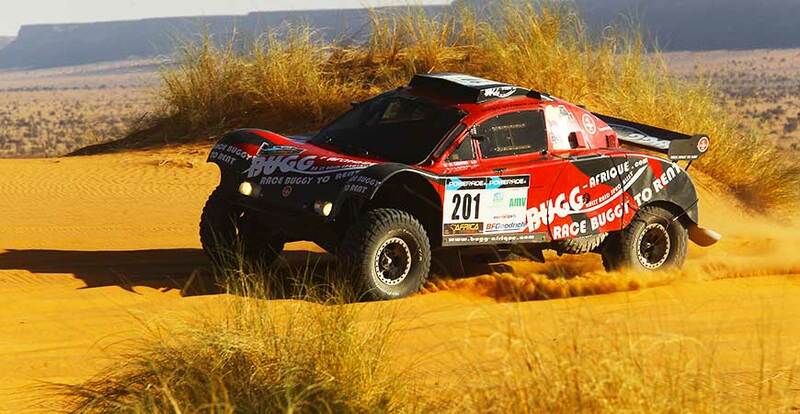 First Run with the Bugga'One Wins Four Stages at the 2014 Africa Eco Race! 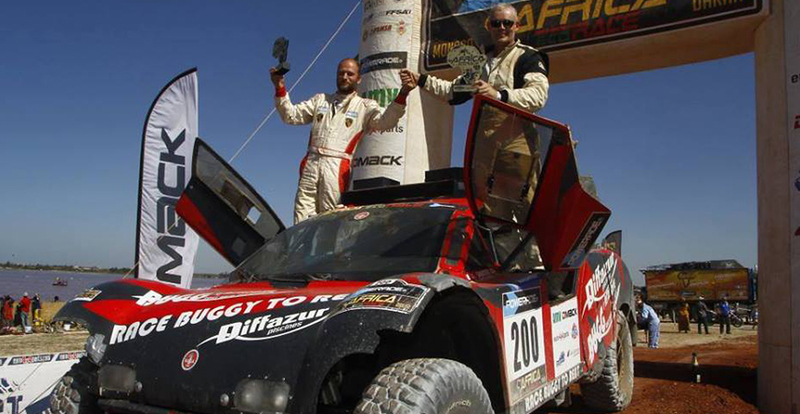 This year, the BUGG’AFRIQUE Team unexpectedly drew attention at the 2014 Africa Eco Race, from start to finish. For their first run with the Bugga’One, they made a big impact right from the start, especially with their win of stage#1. Driver Jean-Antoine SABATIER and co-driver Denis ROZAND won 4 stages with the Bugga’One, and had a wonderful finish as runners-up by the pink lake in the 2WD petrol series. These excellent results are very promising for the future and will enable us to offer the Bugga’One to drivers looking for a reliable and highly-efficient racing car. The Bugga’One might well claim top-three finishes in all rally raid races now. The other BUGG’AFRIQUE team was driving a Predator X-18S. For his debut rally raid experience and with Frédéric DRAULT as his co-driver, Eric LE BIGOT finished 27th overall out of 38 and 4th in the Open series, with his Predator X-18S. Hats off to Eric for his great achievements. The Africa Eco Race is a tough lengthy and challenging race.